Yet still, these extraordinary people are rare. Most of those with Autism are not known, and because of the characteristics of Autism will most likely never will be. Help Us Find a way to END Autism! On April 2nd, the world joins together to “light it up blue.” Thousands of iconic landmarks and buildings join the hundreds of thousands of homes and communities around the world to “light blue” in support of people living with autism. You can put blue lights outside your home or just wear blue in support. Pledge to “light it up blue” now! The Topping Brothers and Autism Speaks SCV are working to raise awareness about autism and raise money to fund the fight! Keep your eyes on this Blog for information on our upcoming fundraiser event happening soon! 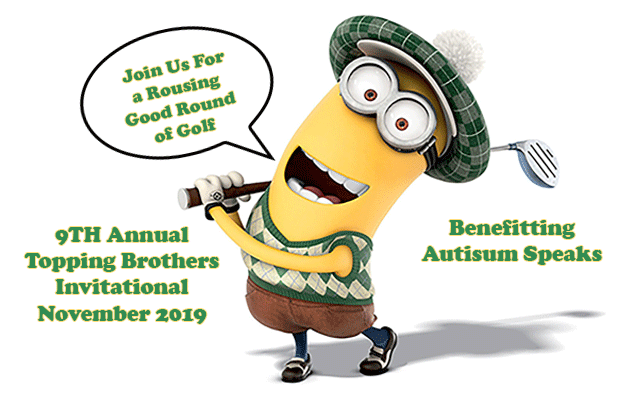 9TH Annual Topping Brothers Golf Tournament coming this November 2019 at The Oaks Club Valencia. Raising Awareness on Autism and finding a cure is Paramount. Visit AutismSpeaksSCV.com to donate now. Local to International!